When most people hear of an impending meteor shower, it might call to mind a sky filled with shooting stars pouring down through the sky like rain, but that is not in the cards for the Leonid meteor shower peaking this weekend. Such meteor storms have indeed occurred with the famous November Leonids. For instance, in 1833 and 1966 meteor rates of tens of thousands per hour were observed. In more recent years, most notably 1999, 2001 and 2002, lesser Leonid displays of up to a few thousand meteors per hour took place. In fact, the 2013 Leonid meteor shower, scheduled to peak overnight Saturday night and early Sunday morning (Nov. 16 and 17), are likely to be a major disappointment, partly because of the expected lack of any significant activity, but mainly because of the moon which unfortunately will be full, flooding the sky with its bright light. Although the Leonids are one of the most famous of all the annual meteor displays they should not be considered a major shower this year, because they likely will be weak and badly affected by the intense moonlight. The Leonids are named for the constellation Leo, the Lion—the point in the sky where many of the meteors seem to originate. The meteors are caused by the Comet Tempel-Tuttle, which sweeps through the inner solar system every 33.3 years. Each time the comet passes closest to the sun it leaves a "river of rubble" in its wake; a dense trail of dusty debris. A meteor storm becomes possible if the Earth were to score a direct hit on a fresh dust trail ejected by the comet over the past couple of centuries. 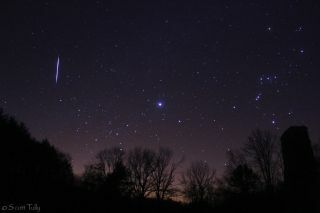 The 2013 Leonids are expected to show only low activity this year with 10 to maybe 20 meteors per hour at best. The "traditional" peak for the Leonids is scheduled for the predawn hours of Nov. 17 and the full moon will be not too far away, shining within the constellation Taurus, making observations very difficult. Watching a meteor shower consists of lying back, looking up at the sky and waiting. In addition to this year's handicap of a bright moon lighting up the sky, keep in mind that any local light pollution or obstructions like tall trees or buildings will further reduce your chances of making a meteor sighting. Leo does not come fully into view until the after midnight hours, so that would be the best time to concentrate on looking for Leonids. Because the Leonids are moving along in their orbit around the sun in a direction opposite to that of Earth, they slam into the atmosphere nearly head-on, resulting in the fastest meteor velocities possible: 45 miles per second (72 km/s). Such speeds tend to produce bright meteors, which leave long-lasting streaks or vapor trains in their wake. Still a mighty Leonid fireball can be quite spectacular and bright enough to attract attention even in the bright moonlight. But such outstandingly bright meteors are likely to be very few and very far between this year. Here's the bottom line: If you plan to brave the chill of a mid-November morning, a moonlit sky and the prospects of catching a glimpse of only a few Leonids, you should get an award for perseverance.